The growth of the church from the small, gothic St. Luke's building to the beautifully appointed and ornamented Trinity Church we see today has been an evolution that included celebrated craftsmen and eminent artisans, recognized as important contributors to architecture, the arts, and organ building. Since 1922, the church building has not substantially changed in appearance. Beginning in 1957, Lovelace and Spillman, church architects from Bethlehem, PA, undertook renovation of the parish hall, lounge, office area, ground floor classrooms and the heating system. During that time, pews were removed from the front and back of the church, reducing seating from 700 to 438. The organ was "...restored to first class condition...". In 1963, the Nicola D'Ascenzo Studios returned to repair stained glass windows in the church and install the Josephine Roades stained glass memorial window gifted by her sister, Mrs. Ethel Roades Garrett. in 1968, the original three-manual 1922 Austin Organ console was replaced by a three-manual Reisner console. This proved to be a bad decision, as the Reisner console began to fail within twenty years. Austin Opus 1040 faithfully served the church for nearly seventy years. In 1990, Crosson and Savage (Cedars, PA) re-leathered, mechanically refurbished, and tonally updated the instrument. 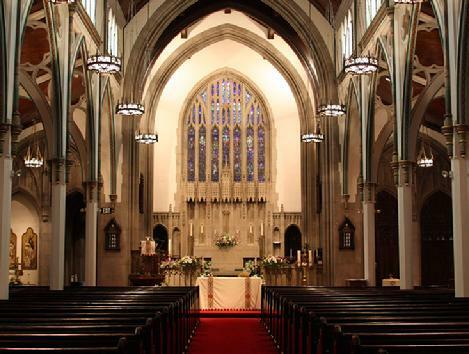 The console and some of the pipework from Austin Opus 2603, First and Central Presbyterian Church, Wilmington, Delaware, were used in this rebuild. The rebuild was made possible in parts by gifts from Susan Starr and Theodora H. Buxton. In preparation for the installation of the Magnificat (Antiphonal) Organ, the 1866 Gallery case was repainted and refurbished in December, 1997. 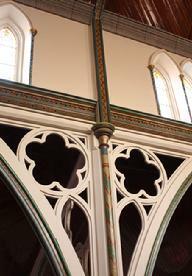 Hinkle Brothers Painters of Emmaus, PA, cleaned and decorated the case and Gallery rail, painstakingly hand painting and duplicating stencil patterns and colors taken from the decoration of the church. Twenty four carat gold leaf was used for embellishment to match the original gold leaf that decorated the case when it was built. Contractors Shollenberger and McGuigan insulated and prepared the interior chambers of the Gallery case to accept the new antiphonal organ. On January 15, 1998, work began on the new Magnificat Antiphonal division of the organ. Built by Patrick J. Murphy Associates, Stowe, PA, the eight stop, eleven rank 630 pipe addition is a memorial gift from Mr. John Giansello in memory of his mother, Catherine Eve Rothermel Giansello, and his aunt, Florence Naomi Rothermel Spotts. The division includes the usual principal chorus, a three rank mixture, a pedal bourdon, a beautiful double-mouthed doppel flute, a two rank string and celeste, and a brilliant, high pressure, horizontally mounted Trumpet-en-Chemade named the "Trumpet Heroique." On March 25, 1998, The Feast of the Annunication, at a Holy Eucharist celebration, the Magnificat Organ was dedicated by the Right Reverend Paul V. Marshall, Bishop of the Diocese of Bethlehem. The service ended with the postlude, Intrada, by Grayston Ives, using the Trumpet Heroique stop of the Magnificat Organ against the full forces of both organs. This piece was originally written for the Silver Jubilee Thanksgiving Service for her Majesty the Queen Elizabeth II. On Sunday, November 3, 2002, again in celebration of the Feast of All Saints, a Solemn Evensong service marked the 175th anniversary of the founding of our Church. The church was filled to maximum capacity, and our organs, along with a string quartet, and our choir, under the direction of Franklin Osenbach, presented a musical program that was recorded for history on a 2 CD set. The voices of nearly a thousand persons singing the recessional hymn Sine Nomine, "For All the Saints," created a moment in history few attendees will forget. A second CD featuring our organs and choir, under the direction of Franklin Osenbach, called "Sing Me to Heaven" was recorded during a Solemn Evensong service Friday, May 7, 2004. This service was offered to the Glory of God and in loving memory of Patricia J. Gamelin. 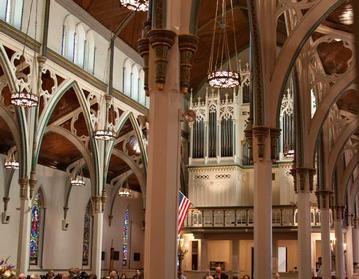 The history of the organs of Trinity Church, and the music they have offered throughout the ages, is a continuing story which reflects the dynamic growth from infancy to maturity of the first church in this city. This history -- our history -- reflects the economic growth of this community from that of a small town in 1820 through the wealth of the coal and industrial years to the 21st century. Let us pause to reflect on the history of this grand place and the challenge for us to preserve, improve upon, and use to the Glory of God the legacy left to us in the treasures of the past.